Who is drilling where in the Utica Shale as of the November 22, 2014 activity report from the Ohio DNR. 258 Utica / Point Pleasant Shale wells in Ohio are classified as "drilling" in the November 22, down 15 from the November 15 report of 273. Harrison (63), Monroe (60), Guernsey (50), Noble (44), Belmont (25), Carroll (9), Jefferson (4), Portage (1), Trumbull (1), Tuscarawas (1). Operators "Drilling": Antero (55), Gulfport (49), Chesapeake (31), American Energy (31), Eclipse (27), Hess (14), PDC (11), Carrizo (8), Triad Hunter (8), Rice (5), Rex Energy (4), HG (3), XTO (3), CNX (2), Hall Drilling (2), Chevron (1), Enervest (1), EQT (1), Halcon (1), Mountaineer (1). Click over to the maps tab to see all wells and well paths, color-coded by status. 273 Utica / Point Pleasant Shale wells in Ohio are classified as "drilling" in the November 15, 2014 report out of the Ohio DNR. Harrison (69), Monroe (60), Guernsey (48), Noble (46), Belmont (30), Carroll (12), Jefferson (4), Morgan (1), Portage (1), Trumbull (1), Tuscarawas (1). Operators "Drilling": Antero (57), Gulfport (54), Chesapeake (40), American Energy (31), Eclipse (24), Hess (17), PDC (12), Carrizo (8), Triad Hunter (8), Rice (5), HG (3), XTO (3), CNX (2), Hall Drilling (2), Rex Energy (2), Chevron (1), Enervest (1), EQT (1), Halcon (1), Mountaineer (1). Map of Utica Shale wells classified as "Drilling"
Permitting activity in the Ohio Utica Shale for the week of November 10, 2014. As of October 18, 2014, 248 wells are classified as "drilling" in Ohio's Utica / Point Pleasant play according to the recent activity report from the Ohio DNR. This time last year the number of wells drilling stood at just 81, giving us a 3 fold increase in drilling activity from last year. Harrison county leads all counties with 62 wells drilling, followed by Guernsey (48), Monroe (47), Noble (45), Belmont (26), Carroll (13), Jefferson (3), then Morgan, Portage, Trumbull, and Tuscarawas all with 1 well drilling. Gulfport leads all operators with 50 wells drilling, followed by Antero (48), Chesapeake (38), American (24), Eclipse (22), HESS (17), PDC, Carrizo, and Triad (8), CNX (5), HG (4), Rex Energy and XTO (3), Hall Drilling and Rice Drilling (2), and Chevron, Devon, Enervest, EQT, Halcon, and Mountaineer with 1 well drilling each. Those that follow the natural gas prices in the U.S. know well the impact of a colder than average winter like what we experienced in the winter of 2013/2014. 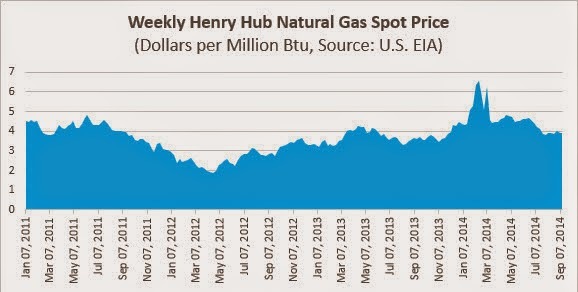 Hedges help to mitigate swings in natural gas spot prices, but storage deficits and draw will eventually hit when contracts expire, and no one can escape a sustained price swing for long. 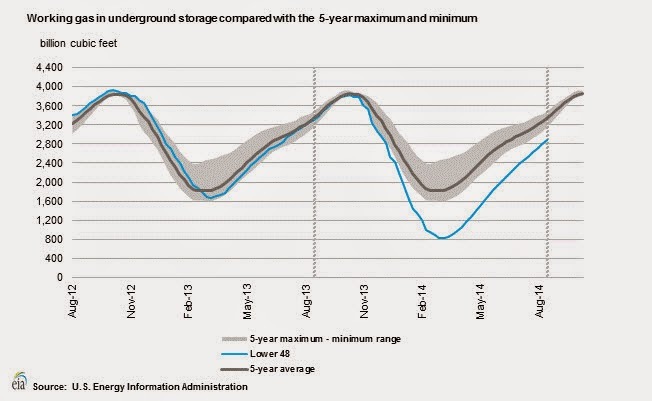 The 2013/2014 winter shocked natural gas storage and set many records. By the end of March, storage levels reached a 10-year low. And February saw the largest natural gas demand ever. Storage recovery still lags, but thanks to the Marcellus Shale, Utica Shale, and others, we are almost there, and just in time with winter around the corner. 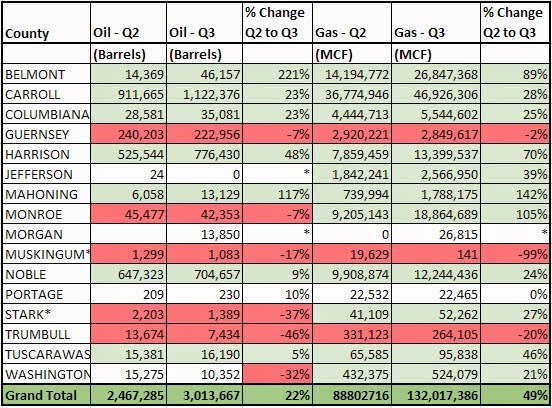 The chart below from the U.S. EIA illustrates a few things worth noting. 1) As the last two years shows, demand starts to outstrip supply in mid to late October, when storage starts to take a hit. Then, after sustaining us through the winter (or just barely so in early 2014), a build up begins in preparation for the next winter. It does not take much imagination to appreciate that this is a delicate balance. 2) The winter of 2014/2015 saw a huge dip in storage, though a simple line projection puts us back where we need to be (for an average fall and winter) at about the same time the seasonal draw in storage is set to begin. As pointed out, natural gas prices are driven in part by storage reports (or in their anticipation due to cold weather forecasts or other factors). Last winter's huge draw on storage created some large price spikes as seen in the graph below. And while many remember the winter of 2013/2014 as bitterly cold, overall, when looking at the 48 contiguous states the departure was only one degree below normal (source: NOAA), though where it was colder mattered, with larger populations impacted. In Illinois the average temperature departure for February was -9.7 degrees F (source: NOAA). Other departures for February 2014 included New York (-1.9 deg F.), Pennsylvania (-3.7 deg F.), Ohio (-5.7 deg F), and Michigan (-6.4 deg F.). Scientists often struggle to forecast the weather from one day to the next, and longer range forecasts in the 7-10 day range can be simply awful. I remember reading from some forecasters back in October and November of 2013 that the 2013/2014 winter in the Midwest and Northeast were going to be anywhere from average to a bit warmer than normal, and then... it was one of the coldest on record in many parts of the country! And of course they had to come up with some "excuse" for why they got it so wrong. A name did the trick, it was all the fault of the "polar vortex". When forecasters get it wrong there is always an excuse, from polar vortex to a dip in the jet stream to an unexpected weakening of El Nino. But all of this does not hide the fact that they missed it. The fancy name or scientific jargon for why the scientists missed it does not change the fact. Some are saying that the winter of 2014/2015 will be extremely cold and similar though not quite as severe as last winter. Others are saying that it will be about normal "unless" a polar vortex or two sets up. "Unless a polar vortex or two sets up"?, that's like saying we are going to see average temps this winter unless we see colder temps this winter. Wow, what a prediction, hard to miss that one. One common way of predicting is by looking at what is happening now, "Hey, we are seeing some of the earliest snowfalls on record in some cities, maybe this means that it will be a colder than normal winter." And we are seeing early snowfall and early cold weather in many parts of the U.S., so maybe we will see a cold winter. I would bet on a colder winter based of the early cold weather and snow, but some might call that too simplistic of an explanation because I did not use the word jet stream, vortex, or Nino in my explanation. A word to the wise, don't mess with Mother Nature (or think that you can predict her with any certainty I would add). When operators set out to drill a single well in Ohio's Utica Shale they are investing an estimated 5-7 million dollars. As a result of such investment, drilling activity is a good indicator of where operators believe the money is, or could be. The latest activity report shows some investment happening by Halcon and Mountaineer Keystone in Trumbull and Portage counties respectively. Time will tell if the investment pans out and if these operators are able to crack the code and find the right formula to economically produce the wells. And for landowners looking to reap some of the rewards, the northern drilling activity is a welcomed sign, though these two wells are but a small bet, and only 2 of 230 wells drilling in Ohio at the date of this post. See MAP of all wells currently drilling below. The map below shows surface locations (white squares) and bottom hole locations (red), along with well paths. Underneath this map I've included a link to a map of all wells in the Utica shale (surface locations only), from permitted only, to drilling, drilled, and producing. 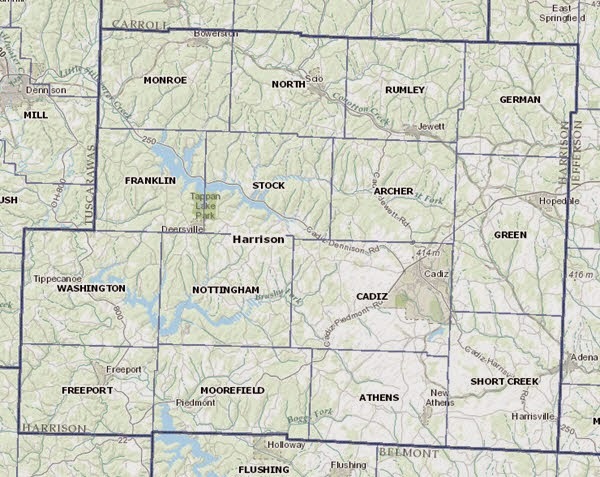 This map has a blue filter tab in the upper left that allows you to create filters to interrogate the data and display based on some criteria, for example (what operators have wells drilled but waiting to be produced in an individual county or township), and so on. Click here to see a map of all horizontal wells in the Ohio Utica / Point Pleasant. (Surface locations only, zoom in to see separate wells on a pad). Note that some wells are permitted only and may not show any activity currently visible on the ground. Nestled in Southeastern Ohio, just west of Wheeling West Virginia, sits the undisputed King of natural gas production in the Utica Shale. Belmont county holds the distinction of being the location of 12 of the top 14 wells in reported gas production in Q1 2014 and equally holds12 of the top 14 Utica Shale cummulative gas producers of all time in Ohio. The county is first in average gas production/day and second only to Carroll County (which has ten times the number of producing wells) in total natural gas production from the Utica as of Q1 2014 report. See chart below. No wonder Belmont County is second only to Harrison County in the number of Utica Shale permits issued in Ohio so far in 2014 (as of the September 6th, 2014 Ohio DNR report). Relatively high gas production from wells in the county is pumping up profits.Top permitting activity in 2014 in the county is led by Gulfport with 36 and XTO (22), followed by Hess (10), American Energy (8), and Rice (1). Gulfport Energy holds 90 total drilling permits in the county with 25 wells producing and 10 drilling. Other operators currently drilling in the county (as of September 6th, 2014) include Hess with 4 wells drilling, XTO (3) and Rice (1). Gulfport also holds the distinction of drilling 13 of the top 15 all time natural gas producing wells in the county. Looking at Q1 2014 production data, top producing wells are situated in western and southern townships, though many of the townships have yet to be probed. And while production activity is rolling in for some townships, other are still in the pipeline and are just starting to be tested or are completely untested. For example, XTO holds 13 permits for the far southeast York Township, with all of their permits accumulated this year, but aside from permitting, no drilling has begun according to the most recent September 6th, 2014 Ohio DNR report. Even neighboring Washington Township, just to the West of York, we see only 2 wells producing and 16 as permitted only. All of this indicates that the county is very much in the early days and we don't have a clear understanding of what is to come. Legend: Legend: Green=Producing, Red=Drilling, Purple=Drilled, Black or Yellow=Permitted only. White squares indicate surface locations. Note: While all data and numbers presented are believed to accurate and reflect Ohio DNR data there is no guarantee that such is the case. The data presented here should not be used for making any important decision. There is perhaps no county hotter than Harrison county when it comes to activity in the Utica Shale. The county either leads or is in second place in a number of categories and based on recent permitting activity the positions are likely to at least hold. Below is a map of Harrison county and its Utica Shale Wells. The map includes surface locations as white squares, well paths, and bottom hole locations. Select the bottom hole locations to see production numbers from Q1 2013 through Q1 2014, along with any other data readily available, including TVD of some of the wells, extracted from FracFocus.org. All other data is extracted from the Ohio DNR. Legend: Green=Producing, Red=Drilling, Gray=Drilled, Yellow=Permitted only. The latest report from the Ohio DNR is out showing activity and new permits issued the week of August 25th, 2014. 17 new permits are recognized in this post though the Ohio DNR reports 20 new permits. For some unknown reason, three Trumbull County BP wells appeared on the list of new permits though these wells were previously reported and already show as producing, as a result, the 3 BP wells are discounted in the data and map below. New permits continue to be focused in the South. Select "Maps" in the main menu above to see all wells by status. Data reflects public information available from the Ohio DNR as of August 23, 2014, including production data through Q1 2014. According to recent Ohio DNR well activity and production reports, Noble County Ohio wells (Seneca Township in the Northeast specifically) are some of the most prolific liquid producers in the state. 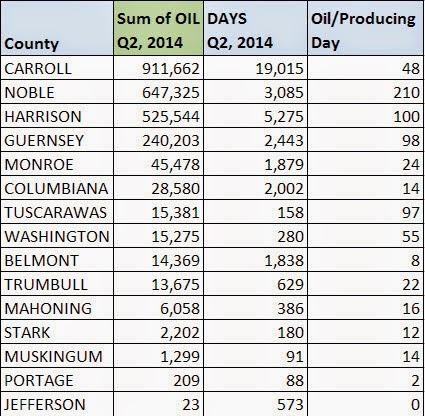 The Q1 2014 released production data showed Noble County with 7 wells (all in Seneca Township) among the top 10 liquid producers during the quarter. Harrison and Guernsey County wells rounded out the top 10 liquid producers. Well paths and bottom hole locations: Red (drilling), Yellow (permitted only), Green (producing), Gray (drilled, not yet producing). Antero Resources has a coveted position in the northern region of the county and is the most active driller as of August 23, 2014 with 35 wells drilling followed by CNX Gas with 3 wells drilling. No other operator showed wells drilling in the August 23 activity report. Antero Resources shows most wells producing with 25, followed by CNX Gas with 23, and Anadarko and Rex Energy with 3 each. Wells classified as "Permitted" only show Antero Resources with 14 followed by CNX Gas, Anadarko, Enervest, and Eclipse with 1 each. CNX Gas leads wells of this status with 11 wells showing as Drilled and awaiting Production, followed only by Antero Resources with 5 wells drilled but not yet producing. 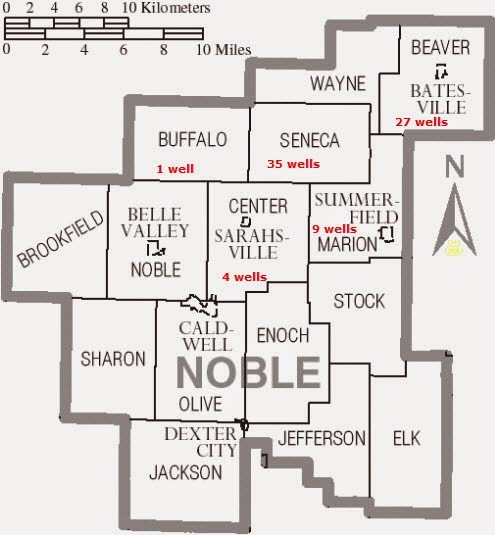 Noble County Township Map with number of wells in each as of August 23, 2014Noble County shows 76 total wells at various stages from permitted to producing. Township by Township wells noted below. Beaver Township shows 19 wells drilling, 4 more producing and 4 permitted. Seneca Township shows 20 wells producing, 5 drilled, 4 drilling, and 6 permitted. Buffalo Township shows 1 well, producing. Important Notice: While care was taken to try to present information accurately and properly reflect Ohio DNR data and reports, the owner takes ABSOLUTELY NO liability and assumes no risk for any errors. Use at your own risk. 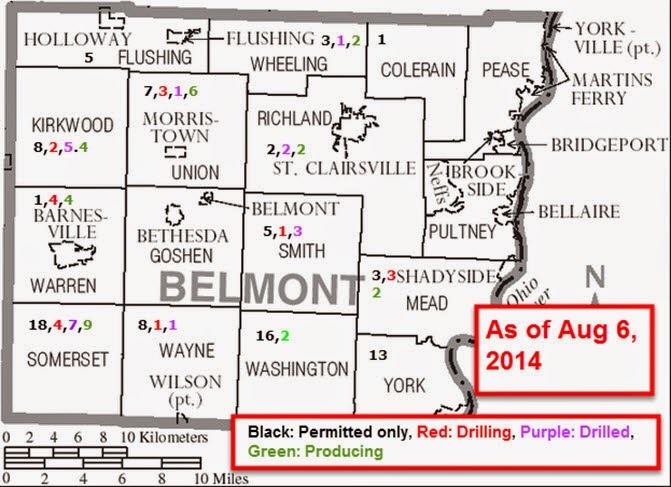 Utica Shale Ohio - 5 Counties with New Permits Issued Week of Aug 18, 2014. The week of August 18th saw 14 new permits issued in 5 counties. Map below includes surface and bottom hole locations, well paths, and county outlines. Belmont, 5 new wells, all HESS, all on one pad. Surface locations purple, well paths and bottom hole locations are red. The U.S. Energy Information Administration (EIA) reported this week that another LNG export project has been conditionally approved by the Federal Regulatory Commission (FERC) and the U.S. Department of Energy (DOE). The new approval goes to the sponsors of the Cameron LNG export project out of Louisiana. The addition of the Cameron Louisiana project brings the total approved projects to three, adding to the Sabine Pass LNG (Louisiana) and the Freeport LNG (Texas) projects already announced. The approval process for LNG export requires the DOE to approve LNG export and the FERC to approve the onshore and near onshore facilities, the latter involving a rigorous environmental impact study. Both the DOE and FERC maintain a list of projects and approval status. The DOE has a longer list of approved LNG export projects listed here. The FERC has a list of projects a various states, potential, proposed, and approved. DOE LNG export applications from various companies can be found here. The winter of 2013/2014 was a harsh one, and to the delight of operators, many of which are razor thin on realizing profits on their shale investments. Without the recent cold winter that drew heavily on natural gas storage and kept natural gas prices at a price floor, we would not be seeing as much drilling as we are seeing now. For all of the good wells that are profitable, there are those that are not, especially in the newer shale plays and the shale plays where brave operators venture out into less-proved areas. Unsatisfactory results in many of the northern and western areas of the Utica Shale in in Ohio is a case in point. BP abandoned efforts in the northern portion of the Utica after poor production results. And Devon, while still in the play, took a chance in the early days on some wells in the east and had a similar outcome. In order to venture out into the untested areas and make more marginal wells profitable, natural gas prices will need to be at some level that supports investment. In fact, many areas, though having some amount of natural gas or liquids are not being developed based on the current price of natural gas. And even for those operators that want to experiment with new drilling, completion or production methods in non-core areas, the lower commodity prices increase the risk and dampen investment. So while consumers and chemical companies cheer the lower prices, the price is sensitive to a number of things, including how cold it will be this coming winter. Opportunities to export LNG will help to sustain drilling activity and investment with operators banking on receiving higher prices overseas and the pressure that exports will have locally to sustain some reasonable pricing. LNG export also helps to create a pricing environment not so dependent on the U.S. weather and natural gas consumption patterns, offering much needed stability that investors need. As of the August 16, 2014 Ohio DNR Utica Shale activity report, Antero Resources currently leads all operators in wells listed as "drilling" with 38. According to the Antero Resources August 2014 company presentation Antero anticipates "835 future gross drilling locations" in the Utica Shale in Ohio. This represents a significant capital investment when you consider the 5-7 million estimated cost to bring one of the wells into production. And while Antero is currently the most active driller, they by no means hold the most active drilled locations, that distinction goes to Chesapeake with 494 locations reported as "drilled" or "producing". Gulfport reports 73 wells as drilled or producing. While the August 16, 2014 Ohio DNR report shows Antero Resources with 44 wells as drilled or producing. Antero in the Utica "sweet, sweet spot"
As I've noted in a previous post, according to reported production numbers, Antero seems fortunate to have obtained some of the best of the best acreage when looking at BOEPD in the initial months of production of some of their recent wells. And it looks like capital spending is chasing these more prolific wells given Antero's aggressive drilling program, a program that currently exceeds all operators in the Utica in Ohio. Reported Q1 2013 through Q 1 2014 production for Antero Resources is confined to Noble (18 wells, more liquids rich) and Monroe (6 wells, more gas rich) counties. 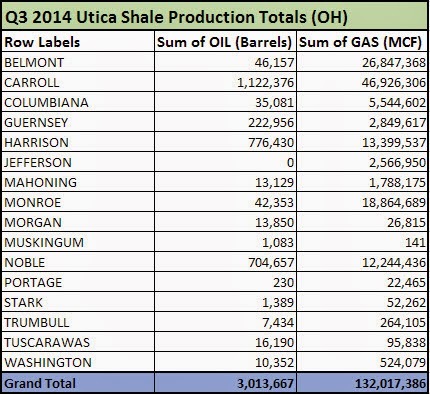 Antero Utica Shale Ohio Production through Q1 2014. Source Ohio DNR data. The August 16 Ohio DNR report shows an additional 6 Antero wells classified as "producing" in Noble county when compared to the Q1 production report. The report shows 14 wells "drilled", 38 "drilling", and 12 "permitted". A map of all Producing, Drilled, and Drilling Antero wells here is below. In each of the last five quarters (Q1 2013 to Q1 2014) the Ohio DNR released production data for Utica / Point Pleasant wells. The data included the county and the number of "producing days" for each of the wells in the county. Combining all the producing days for all of the wells in a county gives us the numbers in the chart below. Total producing days in a county = the total number of producing days for all wells in a county combined. Carroll County is noted as leading by a wide margin in the number of well producing days, representing approximately 56% of the total. Other counties should make gains on Carroll county going forward given the shift in permitting and drilling activity. In the recent August 9, 2014 Ohio DNR report, Harrison, Noble, Guernsey, and Monroe, each showed more than twice the drilling activity of Carroll County. Chesapeake does appear to be seeing some nice profits in their Carroll county wells and are drilling at a steady clip. In the Q1 2014 data we see that the six Putnam wells in Union Township in Carroll County showed nice initial production. The first 53-67 days of production show an average of ~200-250 Barrels of Oil per Day. As a result, I don't see Chesapeake slowing down Carroll County drilling anytime soon. Though many of the Noble County wells are showing even more impressive oil production results with the Antero wells below averaging 630 to almost 1,000 Barrels of Oil per Day in the first 32-68 days of production. Some of the Harrison and Guernsey County wells are also putting up some nice numbers, showing around 500 Barrel Per Day of production the first two or three months that they come online. Some Gulfport, Hess, Carrizo wells in those counties are seeing the 500 BOPD production numbers. 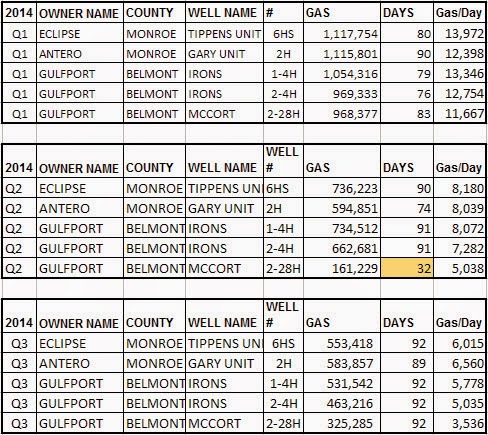 Monroe and Belmont Counties, while not showing much oil production, are showing some of the most prolific gas production. The technology mix and process used to exploit the wells is evolving so we should expect to see production records broken as operators learn more and hone their methods of exploiting the Utica / Point Pleasant play in Ohio. Stay tuned.